WE totally wore the sameish thing today. I wore a yellow cardi, b/w print top and jeans. Love the yellow and b/w combo :) Yellow suits you very well. I LOVE yellow and navy together - just might be one of my favorite color combos ever. 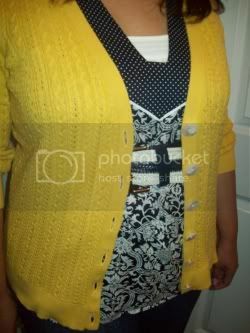 Great top, greater cardi! Love the color combo today. Enjoy your weekend! I love the yellow on you. I told you that any color looks good on you. I think your outfit is cute....where did you get your shoes from? Cute! I have the same issues with yellow - it looks really good with the navy! I'm going to have to try that. Pretty yellow, and I love that top! I want to see it without the belt next time, pretty please. I bet it totally can be worn all on its own. Sabrina – Yes! Great minds! Nika, Mariana and She Spys – thanks! Cynthia – thanks – hope yours was great too! Corie – Thanks. These shoes are from Aerosoles! :-) I get them at the Aerosoles outlet. Amanda – I keep trying to think of ways to break it up and not have the yellow near my skin. Kristen – thanks! I have one just like this into coral which I will probably wear soo, these two get lots of wear in the summer since they are light. Case – Awww – I think yellow would be super pretty on you – with like a chambray shirt for example. And thanks so much for the award! That is super sweet of you!